My overall point by showcasing the Obama award presentation and the movie ARGO even winning was that the CIA and Hollywood so often work hand in hand.. the CIA writes scripts and pitches them to Hollywood. That is not just the little ole HORROR REPORT saying that, but it’s from WIRED magazine. In a report in 2011, WIRED wrote that the CIA helps the entertainment industry create movies and gives them ideas for subjects.. Just in February of this year, SALON wrote about how the CIA infiltrated Hollywood.. So with that said, it’s plausible that the government can also censor what should be in movies..
And not just the United States. China has been busy, as well. The NEW YORK TIMES reported late last week about Chinese censors and their anger over DJANGO UNCHAINED. 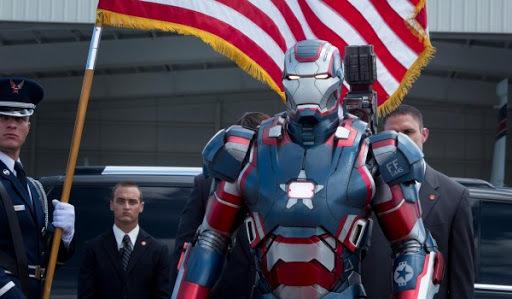 The movie was pulled at the last minute in China..the TIMES wrote that the story showcases the rocky relationship between Hollywood and China’s evolving movie industry..
China was apparently angry at DJANGO.. but they should be quite happy with IRON MAN 3. Why? Because their censors were permitted by Disney to be on the set, and they were able to help get their own version of the film to show in China. Marvel Studios is released a special cut of the film specifically for that nation.. So is this censorship or is this marketing? After all, Hollywood’s success may revolve around getting into new markets. And China is a huge market. They have a lot of people, and therefore a lot of potential movie fans. If Hollywood could tailor its films to be eaten up by other nations? Well, that’s just good business, right? After all, fast food company censor their own product in a sense, too. They don’t give other countries the same unhealthy garbage that is served to Americans.. So it makes sense that, to be successful in emerging markets, Hollywood would have to change their ‘bad guys’ and perhaps their topics.. maybe get rid of some characters that could be thought of as being offensive.. I ask, however, what the long term ramifications of this self-censorship by Hollywood could bring? After all, we know that they have worked closely with intelligence agencies from America, so what would it really matter that they are working with other government intelligence agencies, too? If we ate up the entertainment before, won’t we just do it again? But making more than one movie just to satisfy a Communist government that so often tortures and abuses its citizens? Making a film watchable to a country that could very well be hiding information on an evolving bird flu–one that could eventually turn into a global pandemic? Is that right? Is that moral? Is that just…Hollywood? We can sing hooray for Hollywood all we want, but the close ties between government and Hollywood is creepy for me. But it’s so ingrained in movies, television, music, and print, that we all just accept it and hardly think about it. Until ARGO gets an award from the First lady. And until IRON MAN 3 gets an alternate cut for another nation.. The IRON MAN 3 example is censorship. But it is smart censorship? I’d love your thoughts. Comment on this story, or email me at Bryan@HorrorReport.com, or debate it on the HORROR REPORT Facebook page..